Not to be confused with Tony Mokbel. Marion Anthony "Fat Tony" D'Amico is a recurring character in the animated sitcom The Simpsons. He is voiced by Joe Mantegna and first appeared in the third season episode "Bart the Murderer". 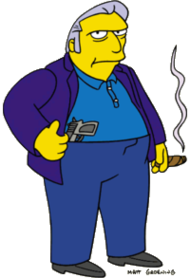 Fat Tony is a gangster and the underboss of the Springfield Mafia. His henchmen include Legs, Louie, and Johnny Tightlips, and he answers to Don Vittorio DiMaggio. The character somewhat resembles real-life mobster "Fat Tony" Salerno. While serving his terms, Salerno died in a federal facility located in Springfield, Missouri. "Fat Tony" D'Amico was behind several of Springfield's criminal enterprises. His rackets included illegal gambling, cigarette smuggling, and bootlegging. In "The Twisted World of Marge Simpson", Homer contracts with the mafia to drive out Marge's rival snack food distributors. Fat Tony took out a hit on Mayor Quimby in "Mayored to the Mob" in retaliation for a raid on their rat milk facility, which Quimby opposed, as they had promised him "dog or higher". Fat Tony puts out a contract on Homer after his private security business interferes with the mob's interests in "Poppa's Got a Brand New Badge". Homer would have been executed gangland-style if not for Maggie coming to the rescue with her rifle. Fat Tony's son Michael is first mentioned by Fat Tony as he is talking to Marge in "The Seven-Beer Snitch", saying she drove him home from school sometimes. He is then properly introduced in the episode "The Mook, the Chef, the Wife and Her Homer". The episode also reveals that Fat Tony's wife "was whacked by 'natural causes'." Fat Tony and his associates meet in what is known as the "Legitimate Businessman's Social Club". Fat Tony played the violin in "Insane Clown Poppy". Fat Tony dies in the twenty-second season episode "Donnie Fatso", only to be replaced by his slimmer cousin "Fit Tony". By the end of that episode, Fit Tony has taken to eating as a way of dealing with the stress of assassination attempts. His weight gain causes a change of nickname to "Fit Fat Tony" and eventually "Fat Tony", essentially restoring the original character. In "The Real Housewives of Fat Tony", he supposedly marries Selma, but the relationship falls apart when Selma discovers Tony only held a ceremony to make her his goomar as he is already married to another woman. 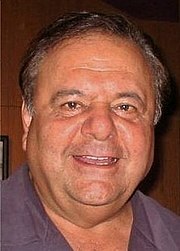 Fat Tony's visual appearance was modeled after actor Paul Sorvino. Fat Tony's actual name is the source of some dispute, as several different real names have been revealed over the course of the series. In the third-season episode "Bart the Murderer", Fat Tony is referred to in a news report given by Kent Brockman as William "Fat Tony" Williams, presumably an alias. In the eighth-season episode "The Homer They Fall", the announcer at Homer's boxing match against Drederick Tatum refers to Fat Tony as Anthony D'Amico (incidentally the name of one of the three Re-Recording Mixers in the end credits), which he is called later as well, for example, by the FBI. In the twelfth-season episode "Insane Clown Poppy", Frankie the Squealer claims that Fat Tony's first name is Marion, a reference to actor John Wayne's real name, Marion Robert Morrison. Joe Mantegna was cast as Fat Tony because Sheldon Leonard was unavailable. Fat Tony first appeared in the third season episode "Bart the Murderer". The writers conceived the episode before the film Goodfellas, which has a similar plot, was released. However, when it was, the writers incorporated references to the film in the episode. Fat Tony was modeled on Paul Sorvino, who played mobster Paul Cicero in Goodfellas. The appearance of Louie, one of Tony's henchmen, was based on another Goodfellas actor, Frank Sivero. 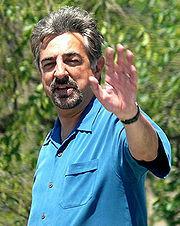 The end of the episode portrays a TV movie about the events depicted in the episode, in which Joe Mantegna will play Fat Tony (this was before it was decided that Fat Tony would be a recurring character). In the episode Donnie Fatso, Fat Tony dies of a heart attack; his cousin Fit Tony takes his place as head of the syndicate, but soon becomes known as Fat Tony due to stress-induced overeating. The writers originally wanted Sheldon Leonard to voice Fat Tony. When they were unable to get him, they went with Joe Mantegna. It is his longest-running role. Mantegna commented, "you feel honored that they asked you to do a voice. The fact that they bring you back and keep writing for the character, it is very satisfying." Mantegna based his raspy voice for Fat Tony on his Uncle Willy, a long-standing cigarette smoker. He insists to the producers to "not let anyone else do his noises." Mantegna voiced Fat Tony in a scene in The Simpsons Movie that almost got cut. Of the Fat Tony episodes, Mantegna favors "Bart the Murderer" and "The Mook, the Chef, the Wife and Her Homer", because it was the season premiere. Fat Tony was also voiced by Phil Hartman in the episode "A Fish Called Selma". IGN ranked Fat Tony at No. 18 on their 2006 list of the "Top 25 Simpsons Peripheral Characters". Star News Online listed Joe Mantegna as one of the 400 reasons why they love The Simpsons. In 2007, Adam Finley of TV Squad called Mantegna one of the five best The Simpsons guest stars and Vanity Fair called "Bart the Murderer" the eighth best episode of the show, saying, "This episode makes the cut because of the inspired Mafia satire". Playmates Toys made Fat Tony into an action figure as part of the World of Springfield toy line. ^ a b c d e f Jean, Al (2003). Commentary for "Bart the Murderer", in The Simpsons: The Complete Third Season [DVD]. 20th Century Fox. ^ James Dao (1992-07-29). "Anthony (Fat Tony) Salerno, 80, A Top Crime Boss, Dies in Prison". New York Times. ^ (2009). Commentary for "Insane Clown Poppy", in The Simpsons: The Complete Twelfth Season [DVD]. 20th Century Fox. ^ Moore, Rich (2003). Commentary for "Bart the Murderer", in The Simpsons: The Complete Third Season [DVD]. 20th Century Fox. ^ Kelly, Liz (2007-05-25). "Catching Up with Joe Mantegna". washingtonpost.com. Retrieved 2008-12-10. ^ Jacobs, Jay S. (2004-02-10). "joe mantegna one of us". PopEntertainment.com. Archived from the original on 2008-11-17. Retrieved 2008-12-10. ^ Mantegna, Joe (2009). Commentary for "Insane Clown Poppy", in The Simpsons: The Complete Twelfth Season [DVD]. 20th Century Fox. ^ ""Criminal Minds" Star Joe Mantegna". The Queen Latifah Show. Season 1. Episode 122. 2 April 2014. CBS. ^ Bernardo, Mark (Fall 2004). "Not Your Average Joe". Smoke Magazine Online. Archived from the original on 2008-07-20. Retrieved 2009-08-03. ^ Goldblum, Jeff; Oakley, Bill; Silverman, David; Weinstein, Josh (2005). Commentary for "A Fish Called Selma", in The Simpsons: The Complete Seventh Season [DVD]. 20th Century Fox. ^ Anderson, Mike B.; Moore, Rich; Moore, Steven Dean; Silverman, David (2007). Director's commentary, The Simpsons Movie [DVD]. 20th Century Fox. ^ Rabin, Nathan (2009-04-21). "Joe Mantegna". The A.V. Club. Retrieved 2009-08-03. ^ Goldman, Eric; Iverson, Dan; Brian Zoromski (September 6, 2006). "Top 25 Simpsons Peripheral Characters". IGN. Retrieved 2008-09-18. ^ Jeff Hidek. "400 reasons we love 'The Simpsons'". Star News Online. Retrieved 2008-10-17. ^ Adam Finley (2006-06-20). "The Five: Great Simpsons guest stars". TV Squad. Retrieved 2008-10-17. ^ John Orvted (2007-07-05). "Springfield's Best". Vanity Fair. Retrieved 2008-09-29. ^ "Celebrity Series 1". The Simpsons Action Figure Information Station. Retrieved 2008-12-09.